Frosty is a REW (red-eyed white) doe, also born in December 2011. She is two-time Best of Breed winner, has one leg towards her Grand Champion certificate, and is permanently registered with ARBA. She has had several wonderful litters. Her first litter of kits (July 24, 2012) produced Heartsong Mabel, who has won two Best of Breed titles in her showing with us and has earned a leg towards her Grand Champion certificate. The others sold quickly and have gone to nice homes - both show homes and pet/wooler homes. See the For Sale page to see photos and the sales policy. FAs for sale: We aren't currently raising French Angoras, but you can still purchase their fluff in our Etsy shop! 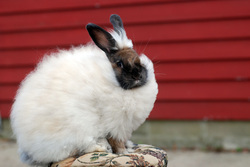 We purchased Frosty and her sister, Delight, from Briar Lane Rabbitry in Owasso, Michigan. 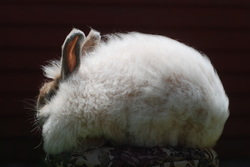 When we picked the two does up from the breeder after the MI State Rabbit Breeders' Convention, we met at an exit along the Interstate and transferred Frosty and Delight to our transport cages. It was snowing and cold, and a fun rabbit adventure that included attending Rabbit School the evening before, and meeting several new friends. Frosty was admired by the judge at her first show where she placed second in the junior doe, white, class. Then in 2014, she won Best of Breed at the Rockville, Indiana show in April. 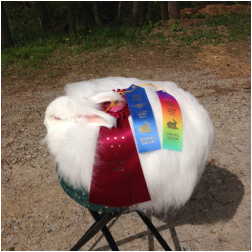 In April 2015, she won Best of Breed and a leg towards her Grand Champion Certificate at the Golden Prairie Rabbit Breeders Association Show in Lafayette, Indiana. Popcorn is a favorite of everyone who meets her. She has wonderfully dense wool and a personality that "pops" right out of her. Her antics during turnout time, or as she is hopping about the house, are rather entertaining. Another nice thing about her is she hops right up to you at the end of turnout time and is ready to be held. Popcorn has produced three lovely purebred litters of French Angoras for us that have shown well and that are great wool producers. Popcorn is also litter trained - something she learned on her own. We keep litter pans in the corner of each rabbit dwelling, and Popcorn, like several of our rabbits have chosen to use the litter pans. It makes clean-up time very easy. We like the "Potty Boxes" available through Bass Equipment. They have a vinyl-coated wire grate that fits over the litter which keeps the Angora's wool off of the soiled litter (wood shavings or pellets). Champ sired several show winners for us. He was a handsome broken chestnut and produced great looking show animals for us with nice, dense fiber. We've retained a broken black buck, Heartsong Isaac, and just recently sold a broken red doe, Heartsong Basil, both now registered with ARBA, from the March 2014 litter. One of the REW does from the Aug. 2 litter out of Frosty, won Best of Group at just about 10 weeks of age! Here is a link to photos of them in our Flickr album. This pretty gal is Heartsong Mabel. (also in the large photo on the left) She is one of our own breeding here at Heartsong Rabbitry. Mabel is super friendly and beautiful, and she has also won the wool class in two outings. 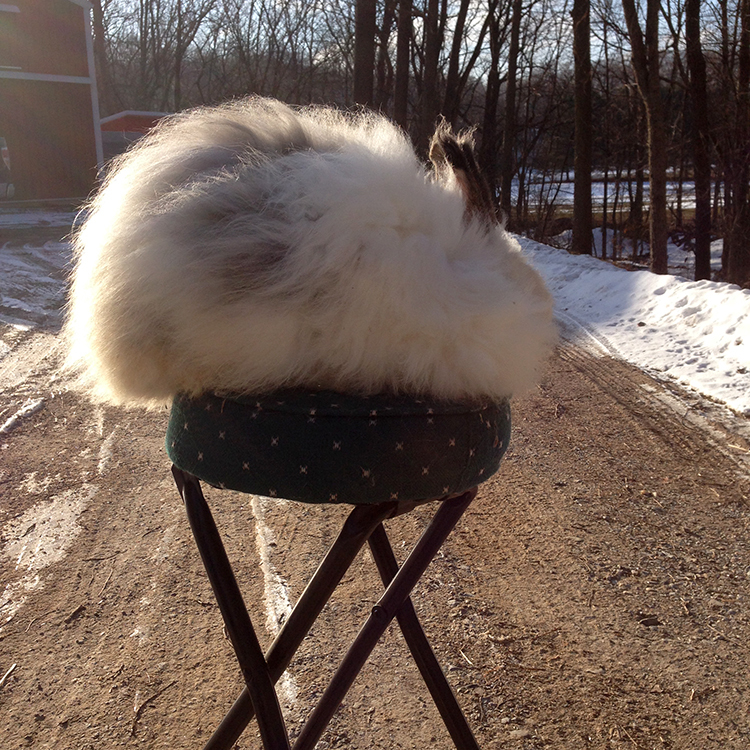 She has twice placed first in French Angora junior does, colored, and has won Best of Breed on two occasions as a senior doe. She is permanently registered with ARBA and has earned one leg towards her Grand Champion certification. Her wool density is extreme and is awesome for spinning.